Unrisen Queen is worldwide known as THE RESURRECTION OF THE VOICE OF FREDDIE MERCURY. More than 100.000 people all over the world saw the band last 4 years tours, which had its highlight at Montreux, Switzerland, been chosen by the Freddie Mercury's assistant, Peter Freestone, to pay homage to Freddie in 2013 & 2015 in the city where his ashes rest. 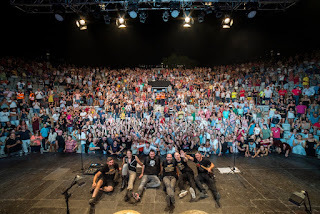 Unrisen Queen has been the first spanish band leading this estival called FREDDIE MERCURY'S MEMORIAL DAY, where public from every corner of the world (Switzerland, United Kingdom, USA, Australia, Japan, China…and many more assist. Unrisen Queen are: Rubén Sabater (vocals), Pasku Frutos (guitars) and Fernando José Gomez (chimi) as drummer.